Weightlifters push themselves hard to maximize their strength gains. Rigorous workout schedules test their limits, and they routinely increase the amount of weight they use so that they're continually challenging their muscles. Muscle soreness and weakness are typical side effects of strenuous workouts and usually do not indicate a serious problem. Prolonged weakness might be a sign of a serious health problem, so it's always a good idea to check with your doctor. When you lift weights, microscopic tears occur in muscle fibers as they repeatedly contract. After your workout, your body repairs the damage using protein and other nutrients. 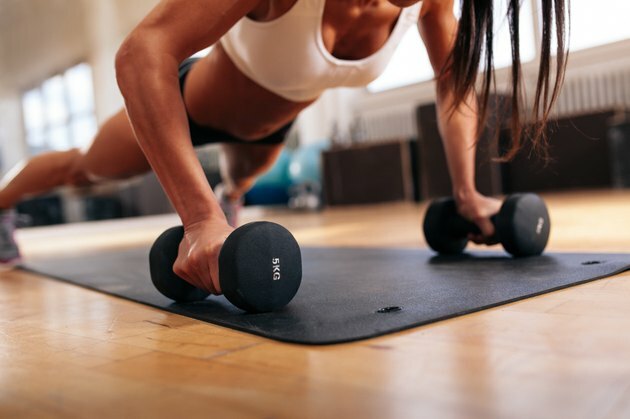 If you sufficiently exercise a muscle and stick to a proper diet, your body’s repairs will result in a muscle that is larger and stronger than before. This is why routine weightlifting adds mass. While your body recuperates after a workout, it is normal for your muscles to feel weak and achy. During this time, it is hard to tell whether you only feel weak because it is painful to move. Typically, the worst symptoms begin 24 to 48 hours after an exercise session and start to disappear after 72 hours, according to the American Council on Exercise. Though there are no known methods for eliminating these symptoms, massaging, stretching and taking nonsteroidal anti-inflammatory drugs may offer you some relief. If you have persistent muscle weakness for an extensive period, contact your doctor. Typically, your doctor will ask what conditions brought on the symptoms. Explain what types of exercises you performed, how long ago you performed them and what your dietary habits are like. Your doctor might say your muscle weakness is subjective, meaning that you feel weak but have not lost strength. On the other hand, your doctor might determine you actually have lost strength, and may recommend diagnostic tests to determine whether you have a serious medical condition. Allow muscles to rest for at least 24 hours after a workout. Many weightlifters design their workouts so that they only exercise certain muscle groups on specific days. This allows them to work out every day without jeopardizing muscle recovery. A typical workout schedule might call for leg and back exercises one day and chest, shoulder and arm exercises the next.